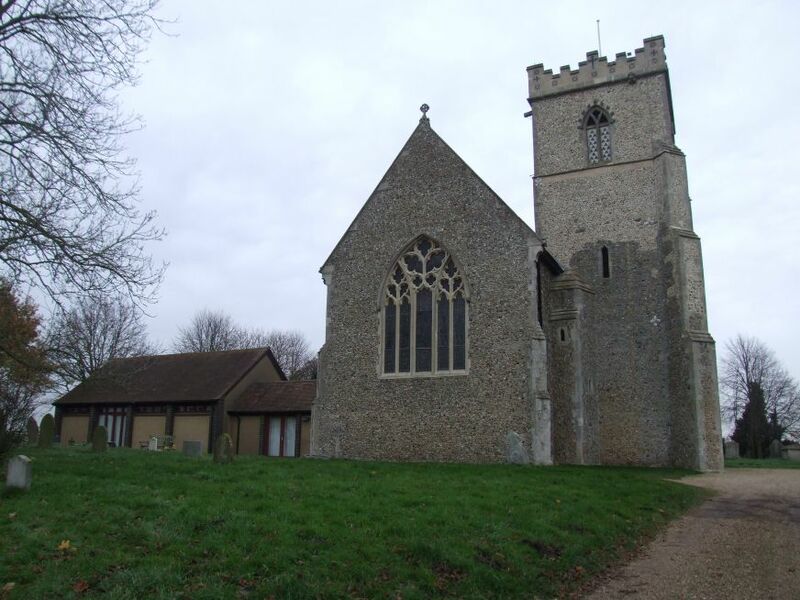 The large, combined village of Barham and Claydon, on the outskirts of Ipswich, has three churches in a line, each one on a hill top above the main road. The most easterly, St Mary, Akenham, is out in the fields with no road within half a mile of it. St Peter, Claydon, the middle one of the three, is thoroughly domesticated by bungalows, new housing and Claydon High School. 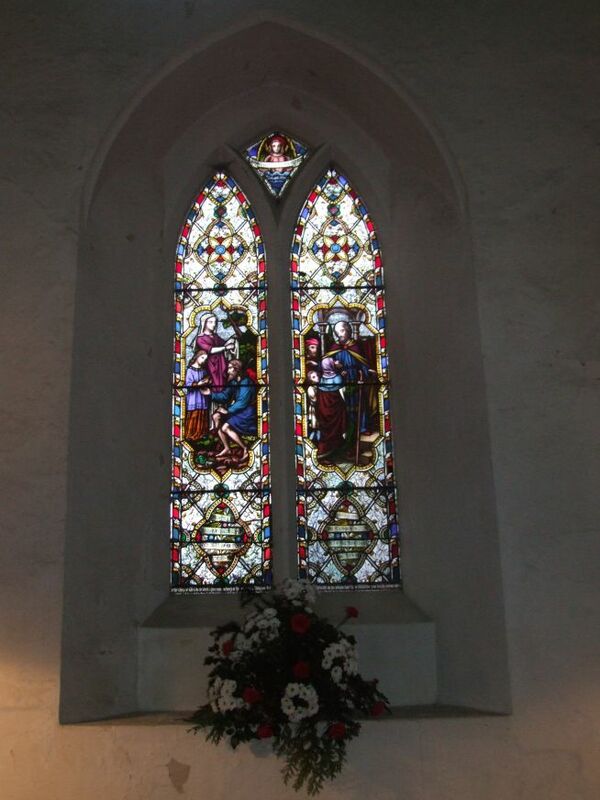 But both those two are redundant now, and Barham church, out on the western edge on the way to Hemingstone, serves the whole community alone. 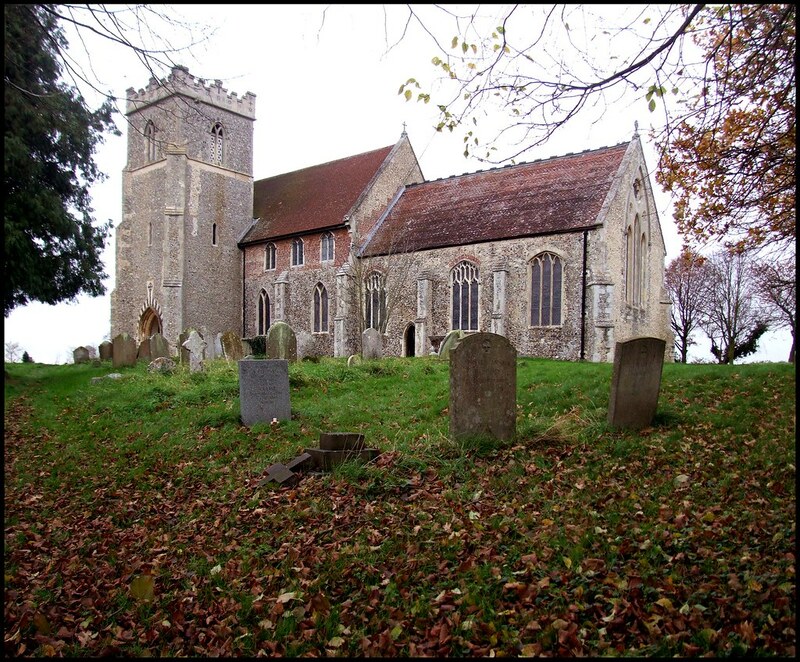 Its dedication changed in the 1970s to include that of Claydon church; until then, it was just St Mary. The hilltop setting here is quite different to that of Claydon. Here, the church is above the houses, above the village, in a vast open graveyard, one of the biggest in Suffolk. You climb the narrow lane up the hill, and then cross from the corner of the graveyard to the big church. The view to south and west is of the industrial landscape of Great Blakenham on the other side of the Gipping Valley. There is a comfortable bulkiness about this church, the massive south tower forming a porch as many do in the Ipswich area. The southern face of it has been genorously decorated in what seems to me an early 20th century style. 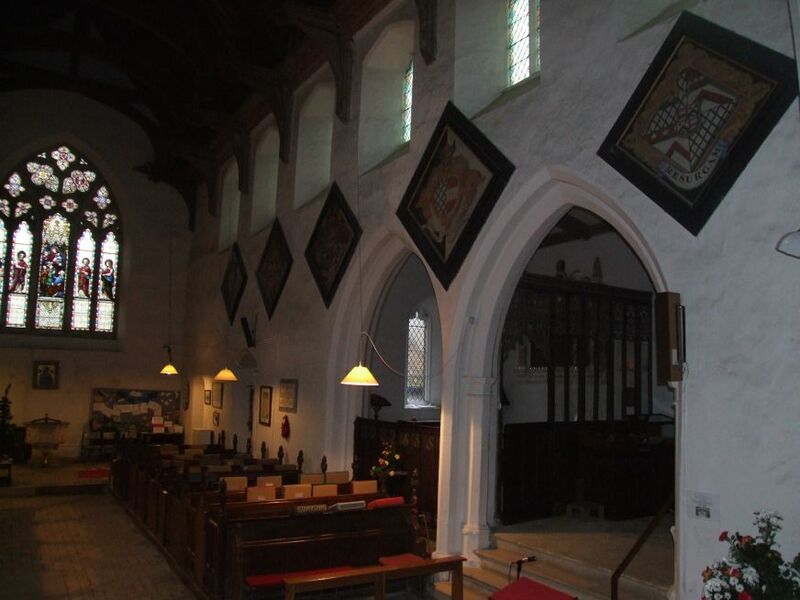 The view from the west is rather curious, the stark face of the nave accompanied by the modern meeting room on the highest point to the north. It isn't that it is bad, it is rather that it is unexciting. Perhaps nowadays it would have been built in a more adventurous style. 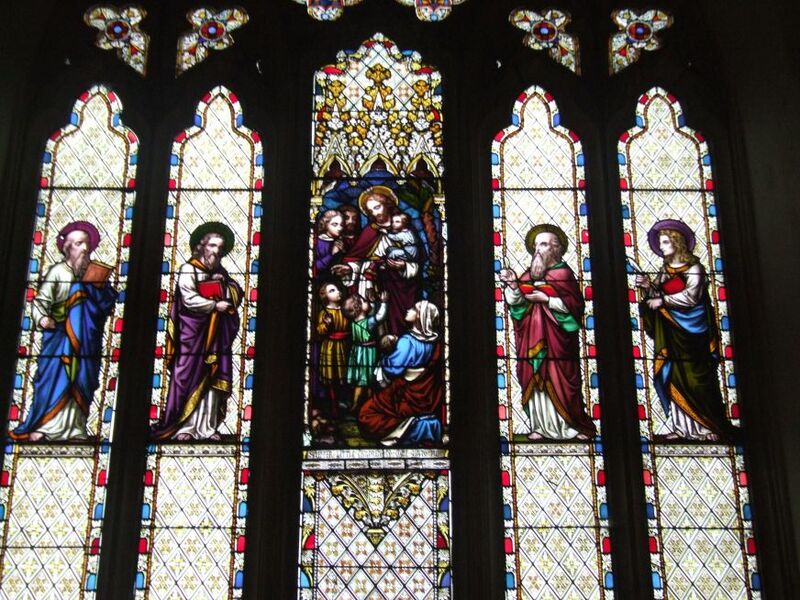 It is worth going around it to see the terracotta window on the north side of the vestry. 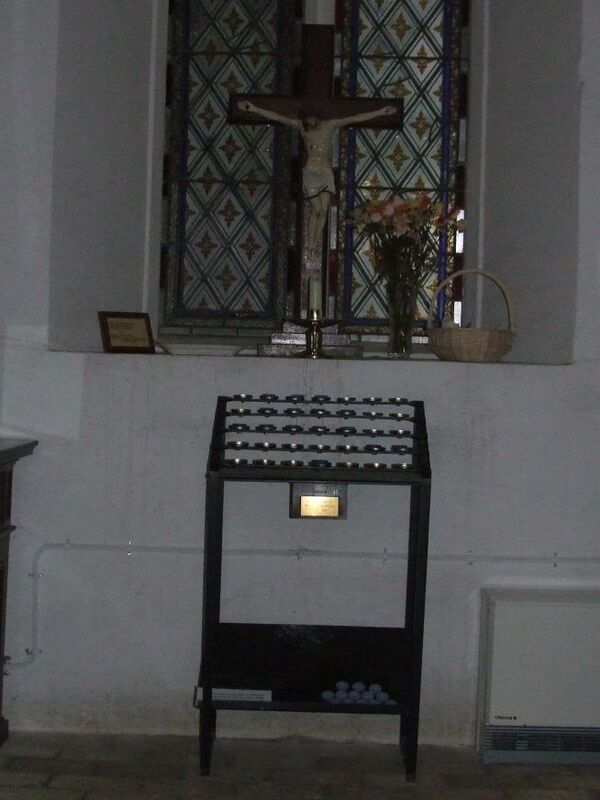 It probably came from the original Shrublands Hall - there is another one in the church at Henley nearby. 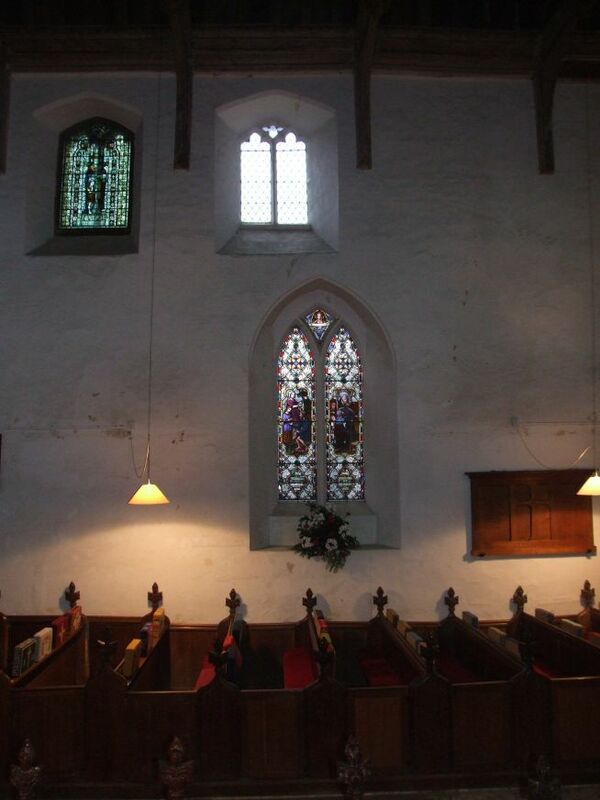 Curiously, the nave has a clerestory on the south side, but no aisle. I certainly regretted it. The misspelling also seemed unfortunate: pompous words should always be spelt correctly. And I'm never sure what a bona fide visitor is. An art historian? A churchcrawler? A grieving mother wanting to pour out her tears in the presence of God? Whatever, if you want to get inside you'll need to get over being treated with some suspicion. To be fair, the person that I went to for the key was most embarrassed by this procedure. I was asked for my address; but, of course, I could have written down anything. I was asked for identification; I don't drive, so I offered my bank debit card instead - the keyholder had the grace to give it only a sideways glance. 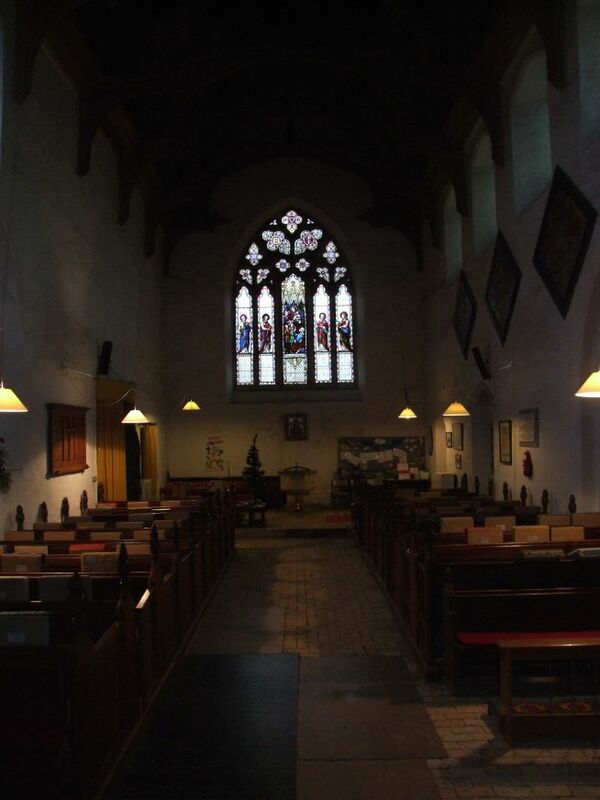 I let myself into the nave, and stepped into a richly coloured interior. There was a big restoration here in the 1860s, but there is also a feel of the ritualism of the early part of the 20th century. 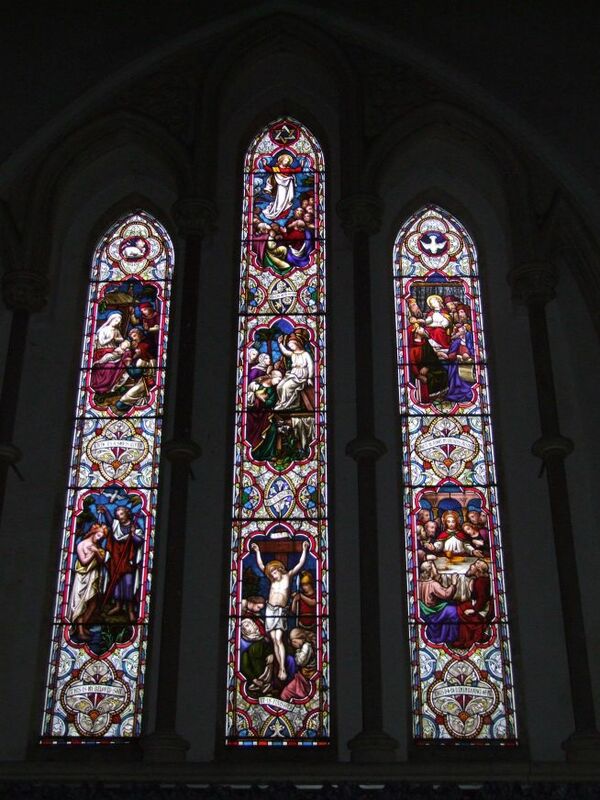 It was a gloomy day, and so it was rather hard to photograph the glass, particularly what appears to be a fine window set in the brick clerestory. 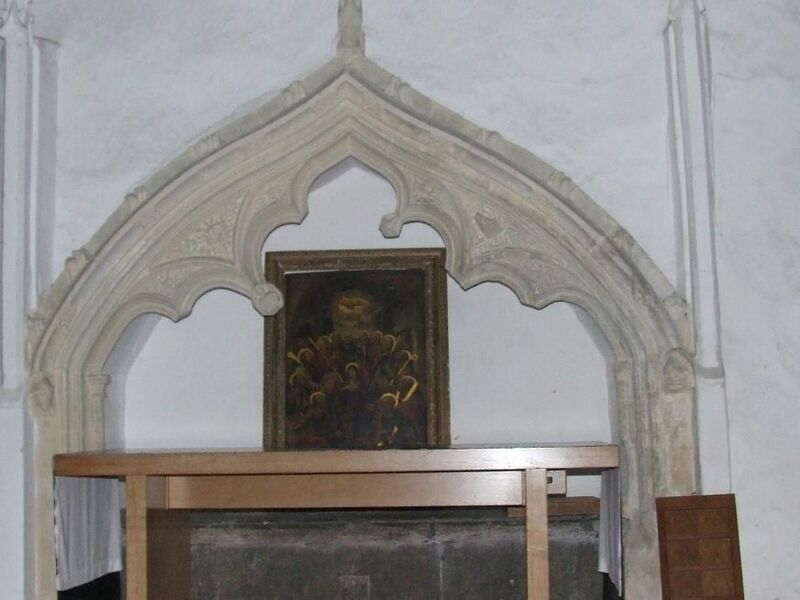 It depicts the figure of Christ with a small boy. I must go back for this: Mortlock thought it might be by Clayton & Bell. The Middleton chapel forms a nave aisle on the north side, and here you find one of the most striking objects in any Suffolk church. 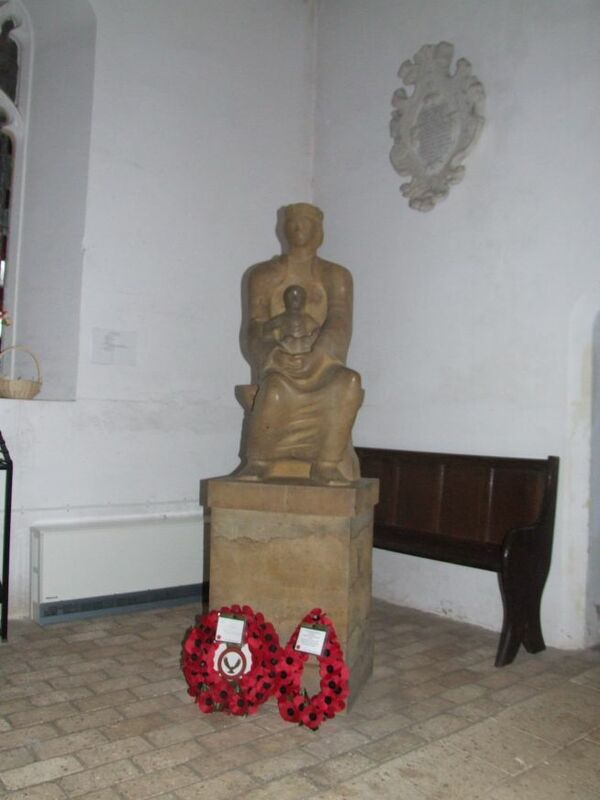 This is the war memorial, a sculpture of the Madonna and Child, by the great Henry Moore. 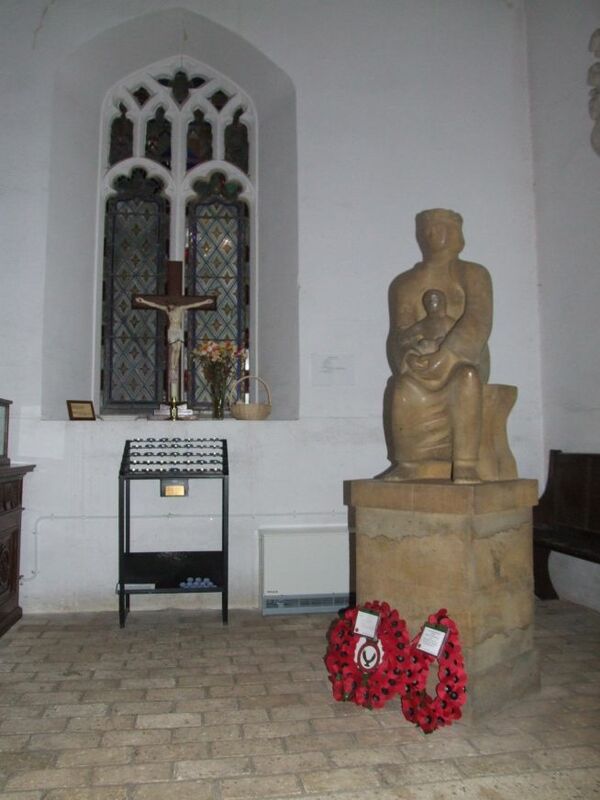 It didn't come from here originally; It was commissioned as the war memorial for the parish of Claydon, and was moved here under Moore's direction when Claydon church closed and the two parishes combined. It must have been quite something, getting it in and out the churches, up and down the hills, although perhaps not the greatest removal feat here, as we shall see. Mary sits patiently, quietly, reflectively, her arms relaxed but encircing her son protectively, pondering things in her heart. 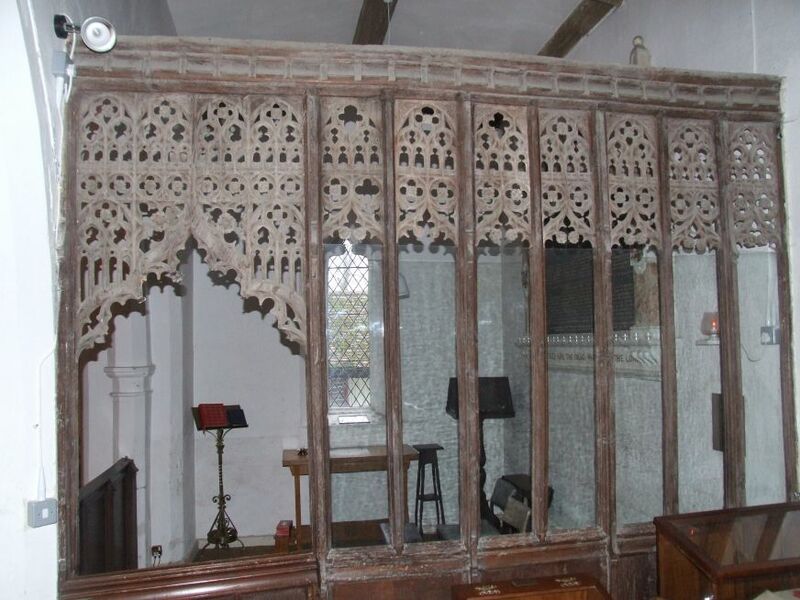 In the next bay west to the sculpture, parts of the 15th century rood screen have been used to enclose a space. When Mortlock came this way in the 1980s it was a blessed sacrament chapel, but nowadays seems to be used as some kind of meeting area. There are two other notable stone furnishings, both much older than Moore's sculpture. 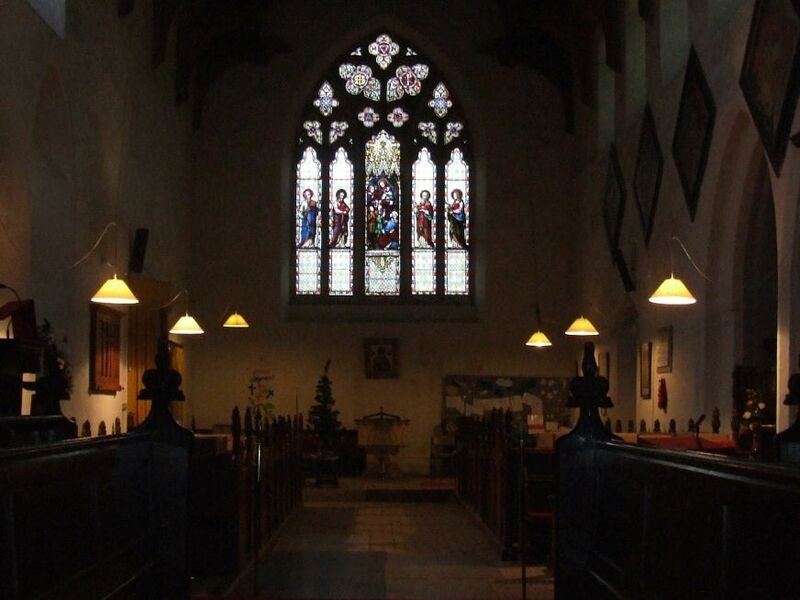 The font is a Victorian copy of the kind of wide, 14th century fonts you more commonly find outside of East Anglia, in areas where no 15th century wealth could provide replacements. It's very well done. 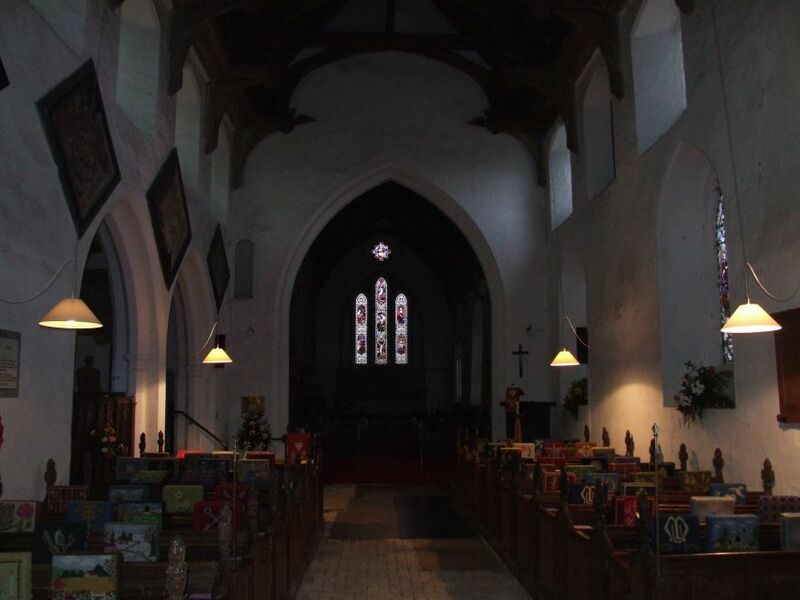 The chancel was largely rebuilt in the 19th century, and obviously designed for shadowy, ritualist worship. However, it still contains a great tombchest with the recumbent figures of Joseph and Margaret Southwell. 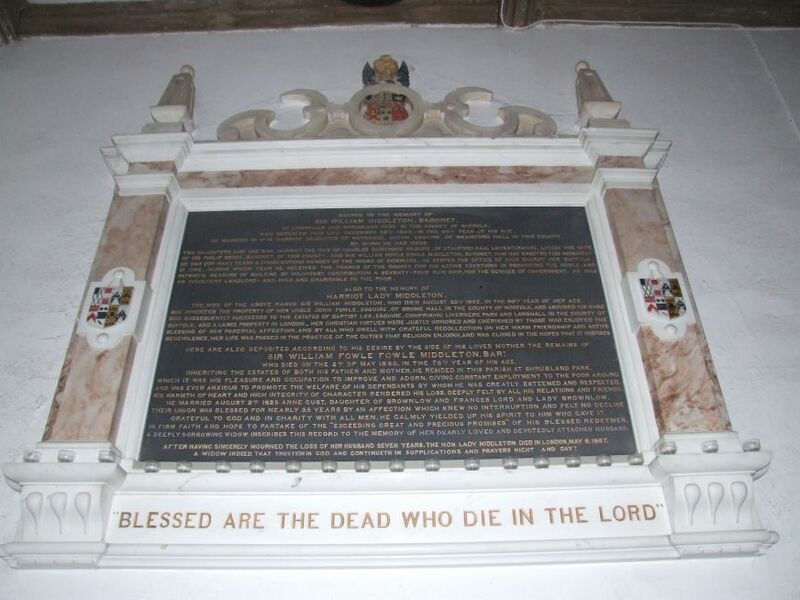 The inscription reveals the extraordinary fact that this memorial was originally sent to Barham from Limerick in Ireland in 1640, by the couple's son Richard. His mother raises herself on one elbow and looks at her husband, as if they were in bed together, and it was morning, and the alarm had just gone off. 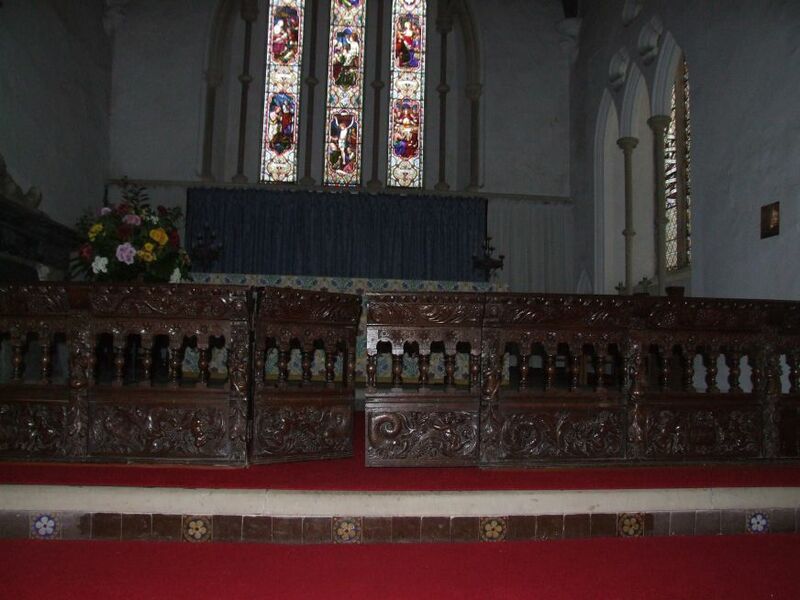 The communion rails are richly carved and polished. Mortlock thought they were probably Italian 16th century. They are certainly imposing. I remember visiting the church shortly before a carol service in 1999, when they were decorated with holly, which was very elegant. The building was full of candles and life. It seemd rather different on this rather gloomy November day, but perhaps that was just my mood. It may be said - it will be said - that the presence of the Henry Moore statue is enough reason for this church to be kept locked. 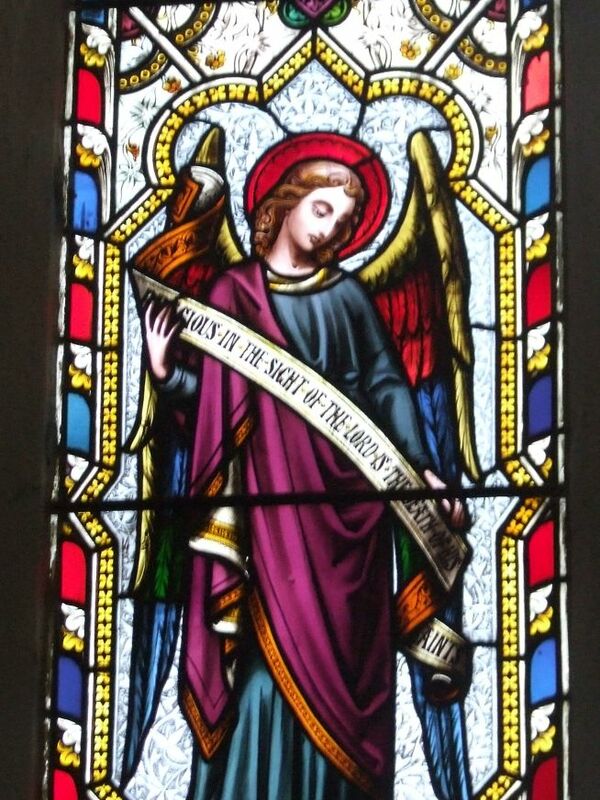 That may be so; nobody could steal it, of course, but I suppose that it is vulnerable to attack, whether by philistine vandals, the currently-fashionable militant atheists, or even Mary-hating protestant fundamentalists, if such people still exist. But Faith itself is a risk, and if the church was only once found accessible by someone who really needed it at that moment, then the risk would have been worthwhile. And if it must be kept locked, and I suppose that at present it must, then I really think the sign could be more welcoming, and the process of getting the key less fraught for both keyholder and pilgrim.